The royal princes grow in Ayodhya under the personal care of Sage Vasishta. They are trained in all kinds of arts that befit the royals and excel in handling various weapons, including especially bow and arrow. One day, Sage Viswamitra visits the court of Dasaratha along with his entourage. He narrates the troubles created by female daemon Tataka and her sons in the Dandaka forest and his inability to complete the Sacrifices he is undertaking. He asks the king to send his valiant son Rama along with him to check the progress of the daemon. The King is taken aback and refuses initially, citing the age of Rama – but upon the insistence of Vasishta, agrees to the plan. Lakshmana joins his younger brother and follows the Sage. Vishwamitra takes them to his hermitage and teaches them some very important mantras – including Bala and Adhibala and provides numerous other magical weapons and Astras which will be put to use by Rama at later stages. These events are captured at Kumbakonam and Pullamangai in four Panels. Prince Rama, standing in front of him in close proximity, is imitating his posture. He is also is Jatamakuta and wearing Silk cloth and a decorative belt. This is one of the Chola sculptures to illustrate how pupils were trained in ancient times by their masters. Even today, martial arts teachers emphasize on the posture of the students, while handling weapons. It is tempting to identify the other two figures are Lakshmana and Bharatha – but considering the fact the Bharata’s presence is not particularly stressed at Pullamangai in many other panels, these characters call for further interpretations. The figure standing in the front could be a considered as a secondary posture of Rama. In this case, he is first carefully observing the posture of his guru before trying to enact the same. Such treatments, illustrating two different actions of the same character, are available in other panels at Pullamangai. The figure to the extreme right of Vasishta could be Lakshmana, closely observing the proceedings. Composition: There are four figures shown in the panel, but as indicated earlier this might represent only three characters. The scene is dominated by Vasishta who, apart from being a Sage, is also a martial arts teacher par excellence. The close proximity and imitation of posture by the student advocates intimacy and absolute submission to the master. Together they represent an excellent Guru-Sishya relationship. Their dominant presence is balanced by two other figures – Lakshmana to the right and Rama on the left. The intelligent adoption of the Sculptor to portray Rama, first as an onlooker and then as a performer is noteworthy. The importance of careful observation before enacting is subtly implied here. Mood of the sculpture (Rasa Bhava): The rasa dominant in this sculpture is Veera (Courage and combat). King Dasaratha is seated with his consort in an Asana in the extreme right of the spectator. He is smiling and his hands are held up. He is in conversation with the visitors to his court, who are shown on the other end of the panel. The queen seated behind him is also smiling. Some vessels are shown in front of the Asana. Two young lads are shown in front of the king. They are possibly kneeling down as suggested by their leg positions. The one close to the King is Rama and he is eagerly looking at the King’s face. 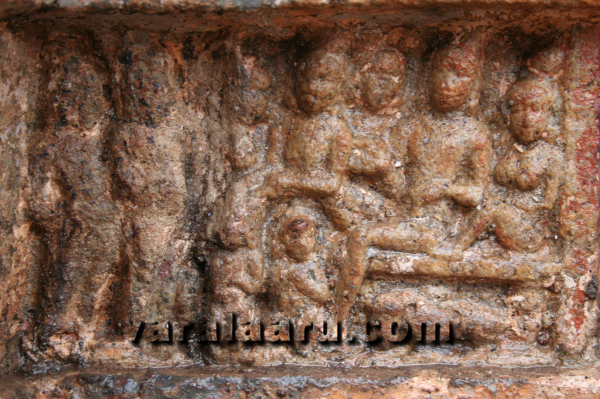 The other lad is shown with folded hands and he is looking at the visitors; this could be Lakshmana. The brothers are listening to the conversation that is going on. The figures of visitors are slightly damaged but their hands are held in Abhaya mudra. Given the placement of this Panel in the narrative, they should be considered as Sage Viswamitra and his associate. The distance between Viswamitra and the King denotes lack of intimacy between the two – which is bridged by the male figure standing in the middle. This figure is in conversation with the visitors. His proximity to the King is emphasized by the left hand which is held very close to the king’s thigh. This should be Sage Vasishta who manages to convince the king that sending the princes with Viswamitra will go good to them. Two female figures are seen behind Vasishta on either side. Both are looking at the King with anxiety. They could be Kausalya and Sumatra (whose lads are now going with the Sage) while the smiling queen seated next to the King, who is less obviously concered with what is happening – is Kaikeyi. Composition: Overall, there are nine characters in this panel. Four of them are King and his queens; two of them are princes; two are Sage band and one is a negotiator. Though there are many characters, the importance given to the negotiator (Vasishta) by positioning in the middle of the panel is noteworthy. His close relationship with the royal family is suggested in two ways: By his physical proximity to the king and by the presence of two queens on either side of the Sage. Given the importance of Vasishta in this panel, it is tempting to suggest that he might have played the role of Sutradari in some of the earlier panels at Kumbakonam. Mood of the sculpture (Rasa Bhava): The sculpture does not suggest any tension in the mind of Dasaratha caused by Viswamitra – whose angry nature is exemplified in literatures. He is convinced and seems to be happy to sending his boys with the Sage. This is a marked deviation in treatment from literatures. In maintaining a distance between the Sage and the King (by positioning them on either side of the panel) the sculptor suggests that they were not very close to one another. This is another deviation from the treatment observed at Pullamangai. The treatment of this episode is in striking contrast to what was seen earlier at Kumbakonam. Here, an intimate relationship between the King and Sage Viswamitra is suggested by a proximate positioning between the two. Their postures suggest a healthy conversation. Since the relationship is already established, the need for a negotiator is deemed unnecessary and hence Vasishta is totally removed from the scene. The King is seated with his queen on one end of the panel. His Veerasana posture suggests confidence and close relationship with Viswamitra. His right hands are held in his calf muscles while the left hand is slightly raised. His entire posture suggests that he is at ease and his conversation is casual. His queen is seated very close to him and is actively listening to the conversation; her posture clearly suggests her intimacy with the king. It should be remembered that this is the very first time that the King is shown with his favorite queen in such a posture at Pullamangai; this composition has already occurred multiple times at Kumbakonam. The Sage and his associates are seated in front of the King in equal Asanas. Once again this is the very first time at Pullamangai where some characters are sitting on par with the King; this suggests the extreme respect with which the Sage was received by the King. The Sage is also at ease and is in conversation. His left hand is held in Varadha mudra, while the right hand is in Katiyavalambitha over his right thigh. His associates are listening actively to the ongoing dialogues. Rama and Lakshmana are seated behind them in their own Asanas. They are actively listening to the conversation. Composition: This is one of the most beautiful compositions at Pullamangai. Overall there are seven characters. The King and his intimate queen are balanced on once side with the Sage and his entourage on the other side. Rama and Lakshmana who are the point of contention are placed in the middle. Mood of the sculpture (Rasa Bhava): The posture of King Dasaratha is the most striking feature of this panel. His Veerasana and casual placement of his right hand on his thigh suggests confidence. But his tilted head and raised left hand suggests concern and conversational mood. He is somewhat concerned with the proposal of the Sage – but not greatly worried. In contract, the Sage is in a mood of convincing the King that the two lads are best suited for his purpose. His Varadha mudra suggests conversation as well as a feeling that “they will be safe in my hands”. The placement and proximity between the King and the Sage is striking. Their equal Asanas denote equanimity. Given such a relationship, the sculptor decides that Vasishta is unnecessary in this composition. Overall both sculptures deviate significantly from the literatures which emphasize on the extreme concern and worry of Dasaratha at the proposal, the ensuing anger of Viswamitra and the critical negotiator role played by Vasishta. 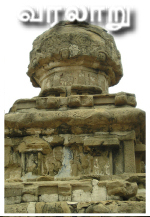 It seems that the Chola sculptures envisioned Dasaratha as a much stronger personality than their poetic counterparts.